The City of Laredo is the county seat of Webb County in the state of Texas, located north of the Rio Grande neighboring the Mexican city of Nuevo Laredo. As of the 2016 U.S. Census estimate it has a population of over 236,000. Being at the south end of I-35 the City of Laredo is a prime location for major transportation companies that deal with U.S.-Mexico trade. The Port of Entry (POE) of Laredo is ranked #1 for inland trade between the U.S and Mexico, with trade flows of over $200B U.S.D. in 2016. 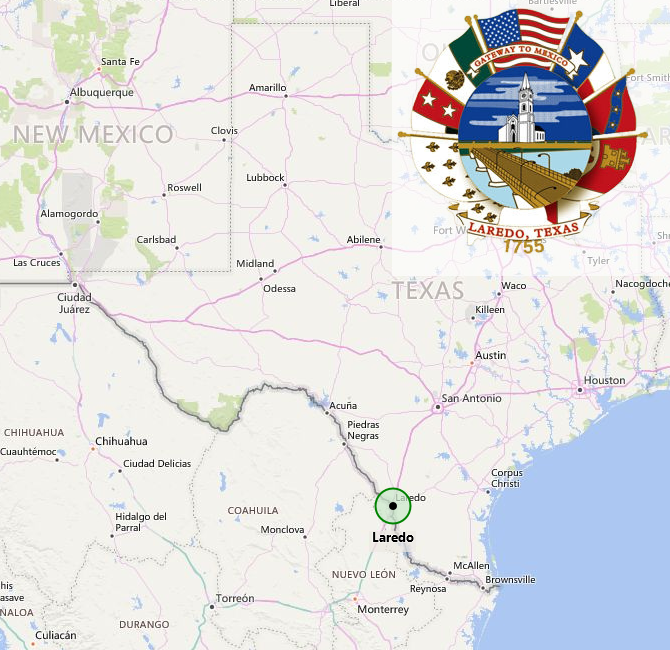 The Laredo POE (2304) is also the head of the trade District of Laredo, comprised of the Texas POE's of Brownsville, Del Rio, Eagle Pass, Hidalgo/Pharr, Rio Grande, Progreso, Roma, Edingburg Airport, Harlingen Airport, and Laredo. Mexico Border City: Nuevo Laredo, Tam. Mexico Border City: Colombia, N.L.